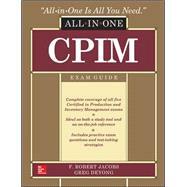 Cowritten by an architect of the CPIM exam and the APICS Operations Management Body of Knowledge (OMBOK), this is a complete study guide for all five Certified in Production and Inventory Management exams. This comprehensive, authoritative exam guide includes sample tests, test-taking strategies, step-by-step examples, and much more. Coauthor Greg DeYong will be taking the exams while preparing the book and will share his experiences and recommendations so you will have a strategic advantage on exam day.